This beginner back workout will pave the way to great posture and easy mobility at the gym and in everyday life. Your back muscles play a key role in your everyday movement and posture, but they’re especially important during exercise when you need the back’s stability muscles to be able to perform the movements. Incorporating our beginner back workout into your fitness routine is vital and will set you up for success with other workouts. “If you want to be able to physically hold and pick up a heavy weight, you have to have your back there to stabilize it,” Brownlee says. Brownlee suggests doing this beginner back workout at least one to two times a week. • Resistance bands: Elastic bands, usually with handles at each end, used for strength training. 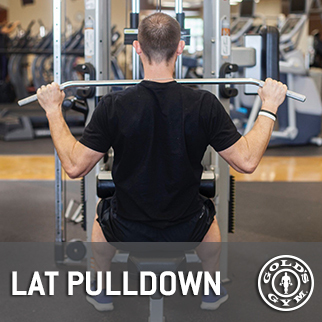 • Lat machine: A resistance machine with a seat and a bar to pull down, which helps work several areas of the back at one time. • Suspension trainers: Two bands that are affixed to the wall with handles at the loose end. • Foam rollers: A foam tube used to give yourself a deep tissue massage after a strenuous workout. Don’t know where to find the equipment? Ask a Gold’s Gym Trainer who can help. Get the blood flowing to your back muscles with these movements. Brownlee recommends alternating moves after each set, and to remember that, as a beginner, your grip strength might not be where it should be — so don’t be deterred if your forearm muscles get tired the first few times. It’ll take a little more time to build them up. 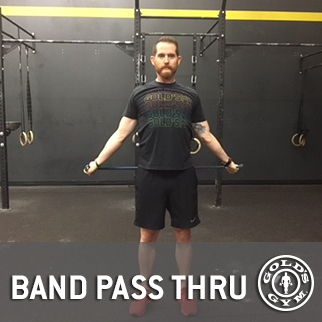 Stand and hold onto the resistance band’s handles with your hands shoulder-width apart. Pull your arms apart — keeping them straight — so the band comes to your chest. Focus on pinching your shoulder blades together. If you sense your shoulders lifting toward your ears, that’s a sign you’re doing this move incorrectly and it won’t be beneficial for you, says Brownlee. The goal: Three sets of 10. 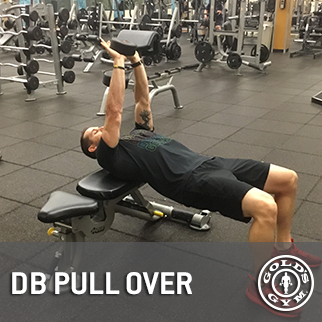 During this beginner back workout, allow for 60 seconds of rest time between each set, and remember to breathe out when you pull the weight toward you. Brownlee suggests starting with a lighter weight, but keep in mind that it shouldn’t be too easy or too hard. Start by lying on your back with your lower back flat and knees bent. Hold a dumbbell at its head, making a triangle shape with your arms above your chest. 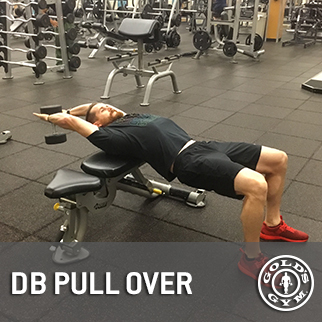 Bring your arms back above your head, keeping elbows slightly bent, and touch the dumbbell to the floor — or as far as you can while keeping your spine on the ground. Then, pull back to above your chest. Tip: “You should feel the muscles working underneath your armpits and maybe a little bit in your chest,” says Brownlee. The goal: Three sets of 12 to 15. 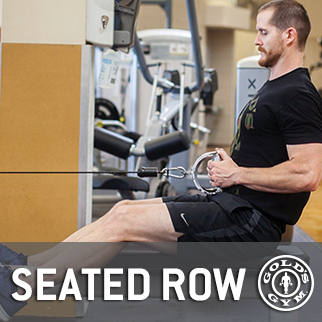 Using a seated row machine, sit down while gripping the cables in each hand, with your palms facing each other and knees slightly bent. Keep your back flat while slightly leaning back from your hips to keep your core tight and engaged. 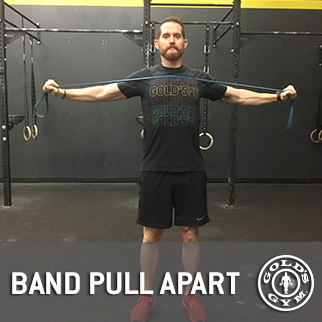 With your arms fully extended, pull each cable to its respective side while squeezing your shoulder blades into your spine. Tip: You should feel the muscles between the shoulder blades pinching, as well as the muscles below your shoulder blades tightening. If you feel your neck tightening, that’s a sign you’re executing this move incorrectly. Sit at a lat machine with your feet flat on the floor and adjust the leg pad to rest on top of your legs. 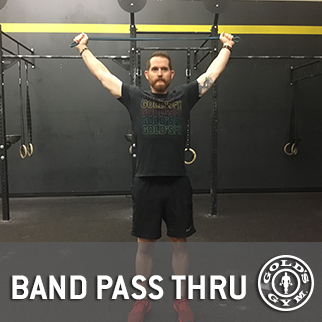 Keeping your hands above your shoulders, create a closed grip on the bar with your palms facing away from you. Pull your elbows toward the ground. 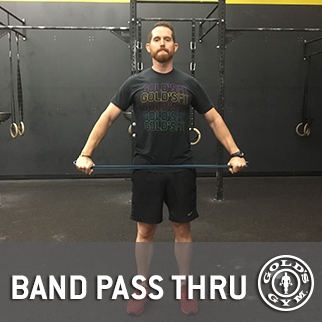 As the bar comes down, slightly lean back from the hips with your back straight. If you feel the muscles below your shoulder blades and armpits tightening, that’s a sign you’re doing the move correctly. If you’re not, you may feel tightness in the front of your shoulders or next to your neck — that’s when you should drop the weight. Holding the suspension trainers, lean back so your body is at a slight angle to the ground with your arms straight and palms facing down. This should feel like you’re holding your body weight up. 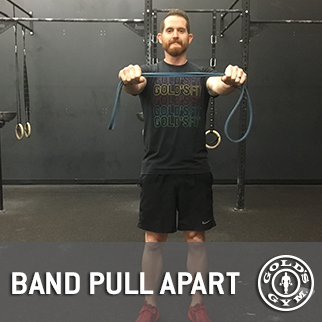 Next, pull with your arms until your elbows are in line with your back. Pause, and go back to starting position. You should feel this in your shoulder blades and the backs of the shoulders, not your neck. Loosen up tight muscles while keeping the blood flowing with these next two moves. Lie back on the foam roller so it’s across your shoulder blades. Place your hands behind your head, allowing your head to relax. Keep your knees bent, feet flat on the floor, hips in the air and elbows pointed to the sky. Push with your legs to move your body over the roller, stopping when it reaches the bottom of your ribs and before the base of your neck touches the ground. Switch sides. The goal: One to two minutes. Keeping it straight, take your right arm and move it across your body. Use your left arm to hold your elbow to your chest. Switch sides. “You should feel this stretch across the upper portion of your back, primarily the back of your shoulder all the way across your shoulder blades,” says Brownlee. The goal: Both arms, for six to eight deep breaths.